The new FL MC EF 660 SCRJ media converter from Phoenix Contact enables the connection of cost-effective polymer and HCS/PCF fiber technology. The optical transmission of data via fiber optics is free of electromagnetic interference and provides complete electrical isolation on the transmission path. This is therefore particularly suitable for Ethernet applications. 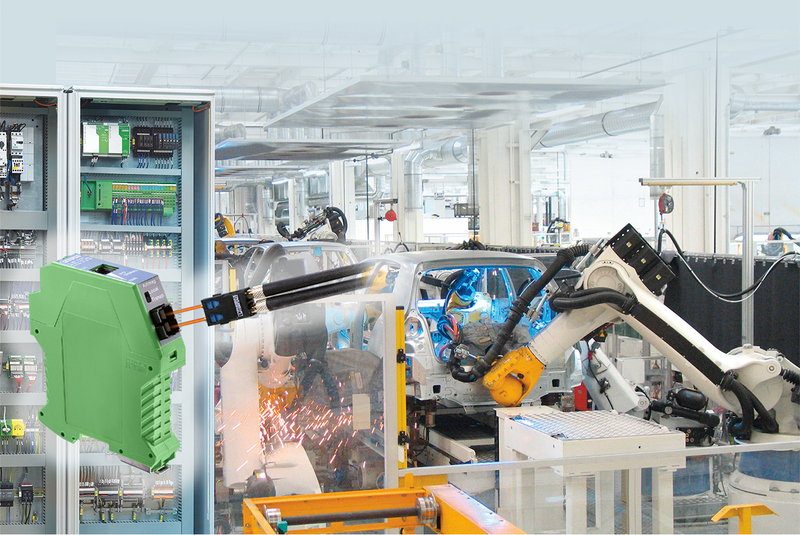 Specifically designed for PROFINET, the SC-RJ connector enables easy self-assembly without specialist knowledge. The devices, which are transparent with respect to transmission, have a short delay time (latency) of 60 ns. This is particularly advantageous for time-critical Ethernet protocols. In addition to numerous diagnostic LEDs, the media converters feature the LFPT (Link Fault Pass Through) function. This ensures permanent and consistent connection monitoring. If a link is lost, redundancy mechanisms can be activated immediately. Integrated fiber optic diagnostics continuously indicate the receiving power via an LED bar graph. In addition, a broken fiber or the instance when the system reserve is reached can be read via two floating switching outputs.